Place in a deep dish with water and cook on high for 10 minutes or until rind is tender. Cook on high for 18 minutes or until jam jells when tested in a cold saucer. Stir occasionally during cooking. Stand 5 minutes before pouring into sterilised jars. Seal when cold. To save time, I double the quantities and make twice as much! You may need to adjust cooking times to suit the fruit mix, the size of your cooking bowl and your microwave. As a rule, doubling the quantity of ingredients doubles the cooking time. I have been making strawberry jam. I have done both microwave and stove top methods and find that my jam does not set each time. I live in Johannesburg and we are 1700metres above sea level which I am sure makes a difference to some recipes (definitely breadmaking – we add more yeast!). I have been using powdered pectin but there are no guidelines as to quantity nor method of adding – I worked on 5ml : 500g strawbs … sprinkling it over the fruit during the boiling process – is this correct? I would appreciate your imput – needless to say none of my results have gone in to the bin – sometimes the ‘jam’ goes over ice cream or even on sandwiches ..!!! Best wishes and I enjoy your website – it is very clear and informative – the reader is not bogged down by incidental bits of detail. I use a 13 g pack of dry pectin to each kg of sugar that I’m going to use and add it when simmering the fruit. Your problem is probably to do with the altitude and getting it to the setting point. I’d suggest that a sugar thermometer would be useful so that you can check more accurately. Just wanted to say this recipe is WONDERFUL – thank you so much Margaret. It’s quick and simple and does away with all that messy chopping. I made it with two sweet oranges and two lemons (the labels say “St Clements”) and I’m so thrilled with the delicious, fragrant results I keep opening the jar and sniffing! Next time I’m going to try it with grapefruit, lime, orange and lemon. One each of the first two and two each of the others weigh about a kilo so can be processed then split into two – I’ve frozen the chopped-up fruit in polybags for later use, when I’ve collected enough empty jars. Thanks again – breakfast has never tasted so good. I have been making this recipe for three years running. 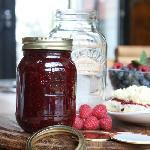 It beats the commercial marmalades by a wide margin, and is so quick and easy to make. 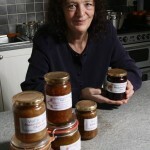 All the commercial marmalades I have tried (lots), are so very bland and sweet that they fail to hit the spot. 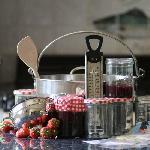 Thank you so much for this recipe, I have made lots of jams this year, it also works well with Blueberries! But you will need to add some pectin and extra cooking time. . 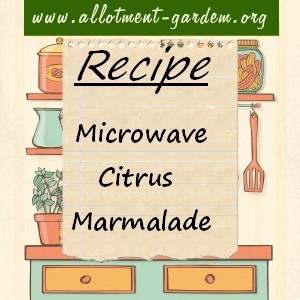 I have never made marmalade before as it always seemed time consuming and complicated. I usually buy homemade though wherever I see it. Tried this today, a lemon and half an orange, turned out perfect I ll never buy it again. I now have so many ideas now that I want to try. Thank you for sharing this. Thanks for this great recipe. I had a bag of limes gifted to me, and decided to try this. So easy and it turned out perfect. Never buying marmalade again just like all the others who commented. Echoing what others have said. This is a wonderful recipe that I keep coming back to. Each year I wait until the blood oranges are in the store, and make marmalade. This year I bought kumquats, a blood orange, and a lemon. (Note – next time I use kumquats, I must seed them). Earlier this fall I bought a jar of “marmalade” for a filling — too sweet and completely flavorless. Perfect but the fruit needs over 20 minutes to be cooked before you add the sugar, this happened to me so I had to cook it more after I added the sugar. You must check the fruit before adding the sugar.